STILLWATER – Oklahoma State fans became statues. They stood, not swaying or wavering their eyes from the court. What was occurring on it was a sore sight for those donning orange while the myriad in purple found reasons to be jubilant. Kansas State embarrassed the Cowboys on their home floor. 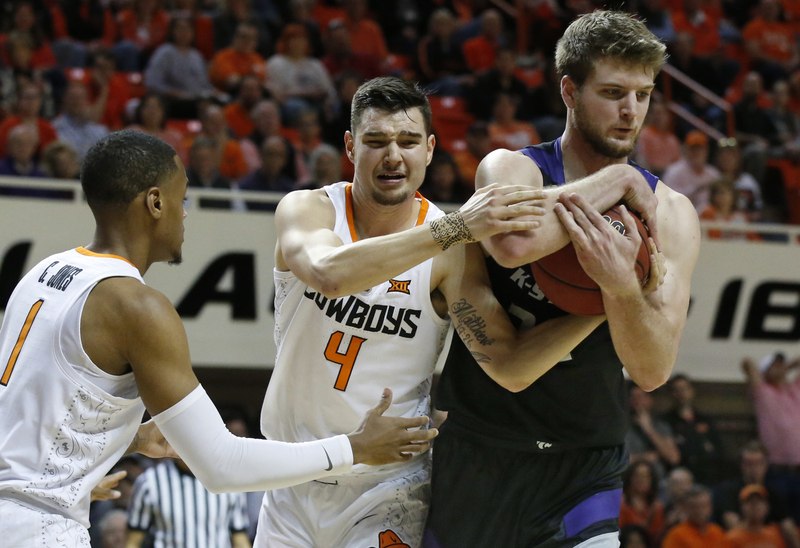 K-State’s blitzkrieg effort on offense combined with suffocating defense not only gashed hopes of Cowboy fans but drained the players on the court. The Wildcats’ 75-57 victory against OSU was no closer than the final score indicated. The Cowboys (9-12 overall, 2-6 Big 12) held a five-point lead early yet trailed heading to halftime by 16. Before the half began, the Wildcats began their control. With 6:18 left in the second half, Mike McGuirl’s 3-point jumper capped a 39-7 run. Spanning halftime, K-State was on a 17-0 run between OSU points. Fans suffered through 6:01 of game time, which was more like 10 or so more minutes of real time, before OSU converted on its first bucket of the second half. Freshman forward Yor Anei’s dunk was the first bucket in 9:18, dating to the first half. The 8,457 fans became stoic, pleading their team to make a bucket while trying to remember the memories of a victory only a week ago. With 5:32 left, K-State (16-5, 6-2) led by 34 before pulling its starters. OSU closed the game on a 19-3 run with a flurry of garbage time 3s against the Wildcat second stringers. The worst home loss in Cowboy history? 33 points against the Kansas Jayhawks in 1966. Had K-State coach Bruce Weber not held his starters back, this inconsistent OSU basketball team could have been on the wrong side of its history. Dean Wade tallied 24 points on 9-of-9 shooting while Barry Brown added 18 points for the Wildcats. When the star duo both exited the contest, they had combined to outscore OSU, 42-35. K-State hit 16 3-pointers, which is its record for the most in a conference matchup. Curtis Jones led the Cowboys with 14 points, though eight of those came during the final five minutes. Lindy Waters added 12. OSU made 11 of its 20 3-point attempts but missed seven of its nine free throws, which is its worst percentage from the line dating to at least 2002. Cameron McGriff, who scored only eight points, said the Cowboys’ maturity will have to show after their losing their fourth game in five contests. Cowboy captain Thomas Dziagwa echoed McGriff’s statement. He said he’s looking forward to moving on to the next game.